b) if it was underwater like all the fields around the area after the recent snow melts and rain. It worked out! Also, my brother Brian drove down from Peoria and we spent the evening photographing the birds there, including among other species Canvasbacks (a new +1 duck for my bird list! ), Buffleheads, Scaups, Pintails, Trumpeter and Mute Swans, hundreds and hundreds of high-flying Snow Geese, and an early Eastern Meadowlark. It was a nice evening, a rare break from the winter we’ve had. 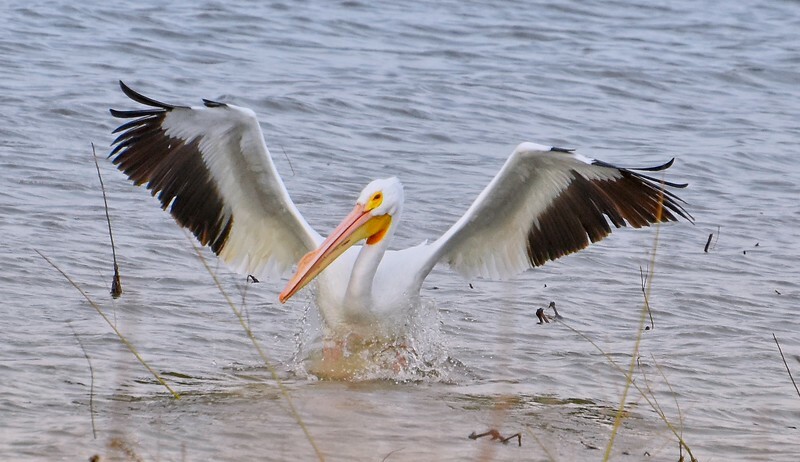 I most enjoyed taking pictures of the large numbers of American White Pelicans. Brian is always surprised (depressed?) when people in Illinois say they can’t believe there are Pelicans this far north, but I have to admit that until I resumed birding I would never have guessed it either (don’t tell him that). And places like Emiquon host thousands of them. They are at once clumsy-looking and graceful, kind of like giraffes, I guess. Here is one of them looking around for a place to land on the water. Not exactly Clark Gable. After he finds a spot, he wobbles around on a very slow descent, looking to all the world as if he’s going to crash-land somewhere. 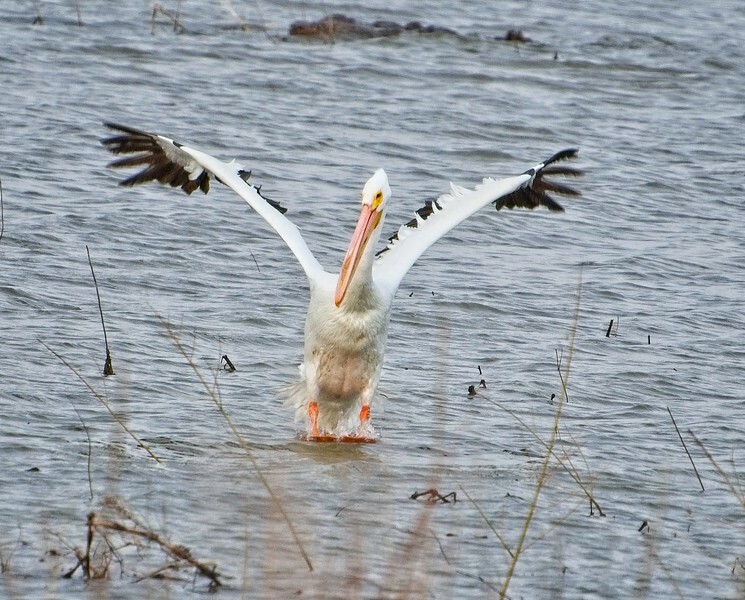 The photo below does not begin to show how unsteady this pelican was on the way down. Whee, the fun part of landing! And there, looking quite pleased with himself after all. 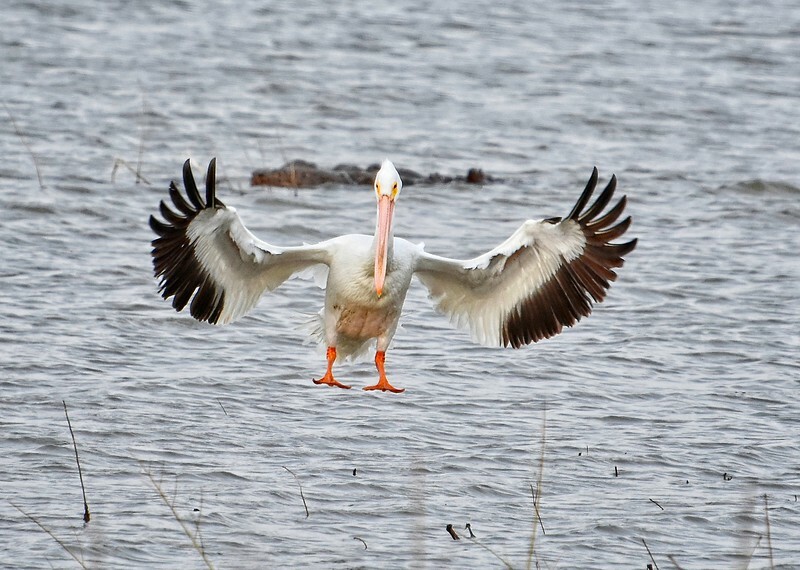 White Pelicans are among the largest birds in the US, larger than Bald Eagles, with wingspans between 8 and 9-1/2 feet! During the breeding season they have a very light yellow crest and grow a horn (called a nuptial tubercle) that you see on top of their bill (Why? I thought maybe they preen the feathers of the female with it, but all I read is that it makes them more attractive.). Cornell says that a small patch of ornamental feathers on the chest can become yellow in spring–once again I wished I had looked up a bird before going to photograph it. None of the pelicans in my shots have this small patch of yellow feathers, but I would definitely have looked for one. Let’s see what else I can find. They feed while sitting on the surface of the water rather than diving from the air like the Brown Pelican, again appearing clumsy when they upend. They work cooperatively to drive schools of fish towards the shallows, but they are also adept at stealing fish from other pelicans and cormorants once they have one. They swallow the fish on the water so they are never carrying food in their pouch (called a distensible gular pouch, by the way). 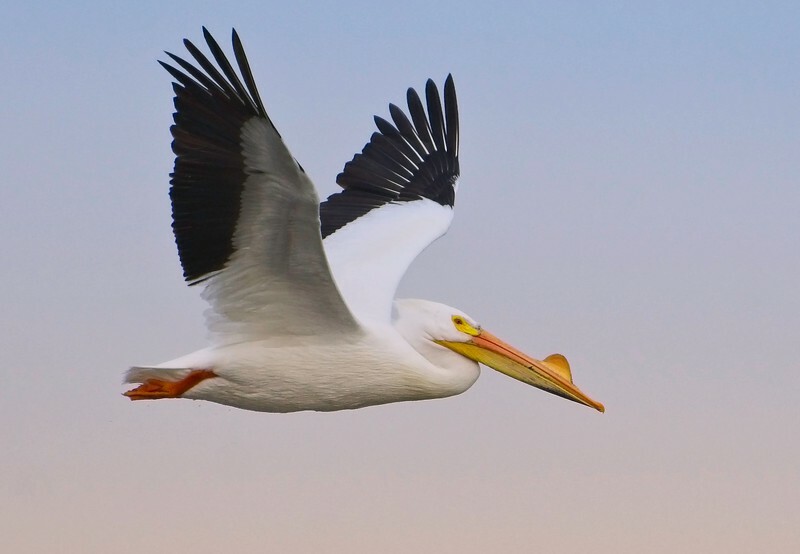 Here’s an interesting factoid: “American White Pelican embryos squawk before hatching to express discomfort if conditions get too hot or cold.” They are also doing well, with a tenfold increase in their numbers since 1966, and would do even better if they would leave the catfish farms in the Mississippi Delta alone. 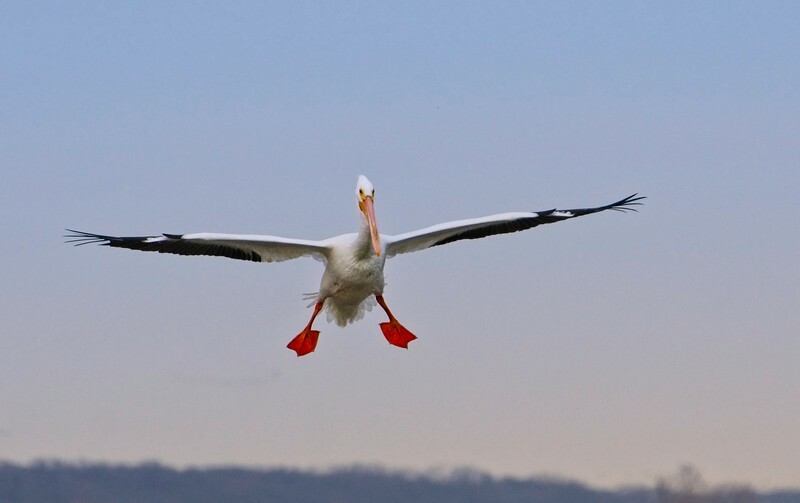 White Pelicans have an awkward, rolling walk, but despite being one of the heaviest flying birds in the world (4.5-9 kg), they glide through the air effortlessly, their long wings looking quite handsomely dressed. They hardly needed to flap their wings as they soared along the shoreline in front of us. They are beautiful and graceful birds of the air. While we were looking at huge flocks of Snow Geese way up high in the late evening, a small number of them split off to form what looked like an arrow telling us to get lost (or at least Brian, as it was definitely pointed toward Peoria). So we left, and that was the end of a fun evening at Emiquon. Ron, I really enjoyed this. I did not know that the White did not dive for fish like the Brown. The landing pictures made me smile. I am now in the Midwest for a few weeks maybe I will get lucky to see some of the migration here. I’m glad to hear that, thanks! 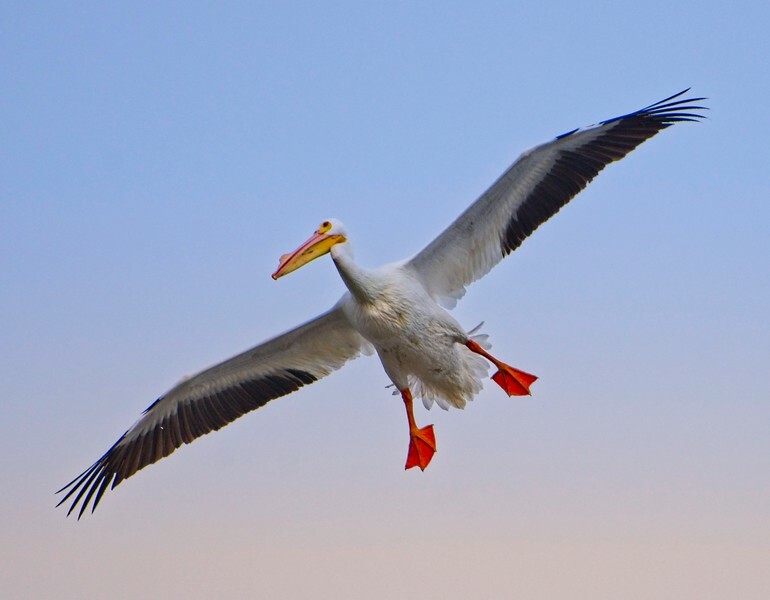 I would think you would find White Pelicans now around rivers–you can’t miss ’em. Good luck! I will look for them. Nice shots Ron. Not a bird we get in the UK though they are in southern Europe. Surprised you have only just seen a Canvasback. I managed to twitch one in 1997 which was only the second UK record. I wouldn’t have recognized these Canvasbacks if Brian hadn’t been there to point them out as they occasionally flew by. I have also never seen a Redhead (I don’t know if you have that kind of duck). Along with Green-Winged and Blue-Winged Teals, I took pictures of a Cinnamon Teal about 4 years ago, a pretty rare bird in these parts. I went to Joliet, Illinois, a couple weeks ago to see a rare Long-Tailed Duck reported at a river dam, but I was not able to find it. I have a ways to go with my duck list, actually. One of the many things that surprised me when I got into birding was all the kinds of ducks there are, not just Mallards. Thanks for commenting, Brian! The Redhead is an extreme rarity over here. Trouble with ducks is deciding if they are truly wild or fence hoppers, far too many are in collections but not tagged or pinioned. My best duck came from the east a Baikal Teal, mind you it was several years before record committees accepted that, much to the relief of hundreds of birders! Ah, you’re right, I just looked and they don’t fly up there at all, nothing really east of Illinois other than Florida. As I mentioned, I still can’t believe they pass through Illinois at all, much less in the numbers they do. Thanks for your nice words! For those that don’t know it, Belinda has a very nice nature blog (just click on her name) and posts much more frequently than I do. Thanks! I was going to mention that I think I pulled that background fade one too many times here, but as you say the settings were not always the greatest even with my Auto-ISO turned on. As you can see, I blew out the whites in the last two landing shots. I didn’t want to bring up the Wilson’s Snipe because I felt bad about accidentally flushing it moments before you pulled up and never finding it again. Actually, I don’t know where I got that quote–where is that from?? 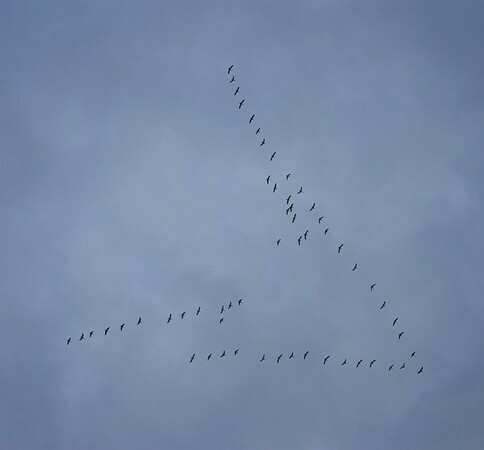 I agree that the arrow was more impressive in person, perhaps because the arrow was moving in the direction it was pointing as the Snow Geese flew in that formation and maintained the outline.